Nara is a small town, as the crow flies is 30 km away from Osaka, famous for its historic and artistic heritage, in particular for its temples. The city was the capital of Japan from 710 to 784 AD. With the exception of some important monuments, most of the interesting places can be reached on foot from the nearby JR and Kintetsu stations. 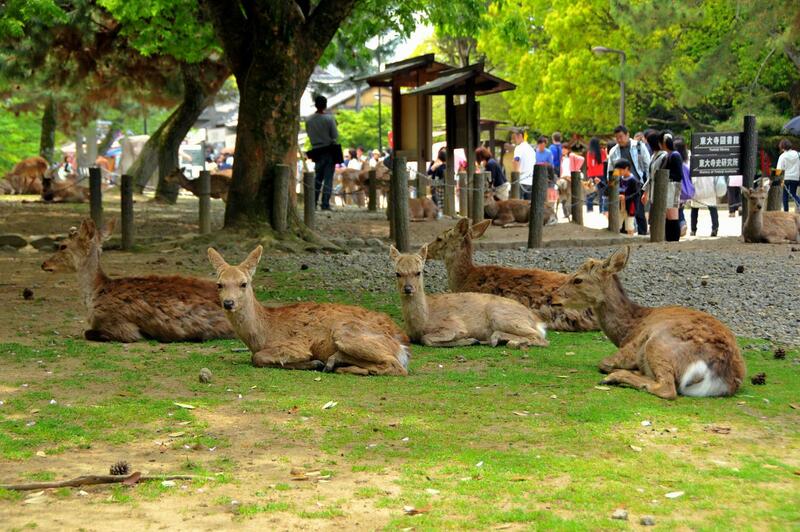 The Nara Park (Nara Koen) is a vast public park where hundreds of deer roam freely and get close to people. The fallow deer is a sacred animal for the Shinto culture, and even up to 1637 killing a deer could cost the death penalty. If you want to be surrounded by deers just buy some crackers made ​​especially for them, on sale around the park (shika-senbei). Within this park there are some of the most popular and visited attractions of the town. A large Buddhist temple built in 752, this temple holds two records: it houses the Japan's biggest bronze statue (Daibutsu) of Buddha (the second is located in Kamakura), which is located within the Daibutsu-den which is itself the largest wooden building in the world, although it is a reconstruction of 1692, even smaller than the original building. This temple is part of UNESCO world heritage. Two beautiful Japanese-style gardens, very close to each other, near the Todaiji temple. The Yoshikien Garden (free admission for foreign tourists, opening hours 9-17, closed from dic 28 to mar 19) is in turn divided into 3 well-kept gardens in different styles: a moss garden, a traditional garden around a pond and a tea ceremony garden. The Isuien Garden (admission 650 yen, opening hours 9:30-16:30, closed on tuesdays) is located north of the Yoshiken, on the other side of the Yoshikigawa river that flows between the two gardens, and within there is a small museum with several ancient Chinese objects and some tea-houses. The most important Shinto shrine of the town, it can be reached reached after a long walk through a quiet wood (Kasuga Primeval Forest). To the sanctuary also belongs the Manyo Botanical Garden (admission 525 yen, opening hours 9-17, from dec to feb until 16:30 and closed on mondays), a very special botanical garden containing all the plants mentioned in the Man'yōshū, an ancient Japanese collection of poetries. 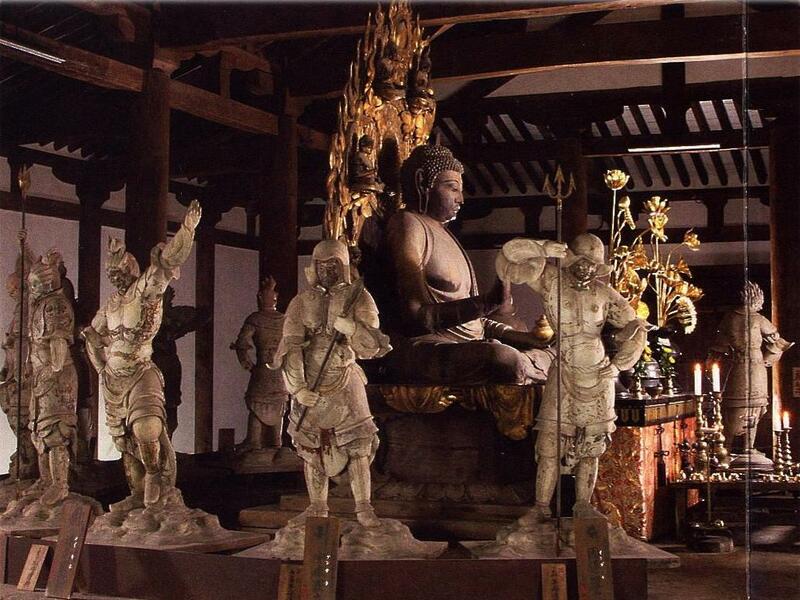 A museum with a very important collection in the world regarding the Buddhist art. Even this temple is included in the UNESCO World Heritage list. 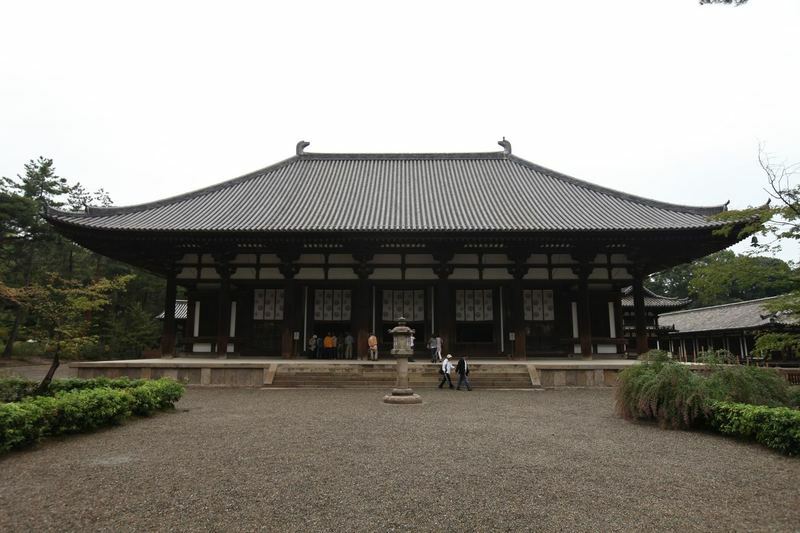 It was the personal temple of the most important family in Japan during the "Nara period" (710-794), the Fujiwara clan. At that time it included about 150 buildings, today very little has remained of the original. 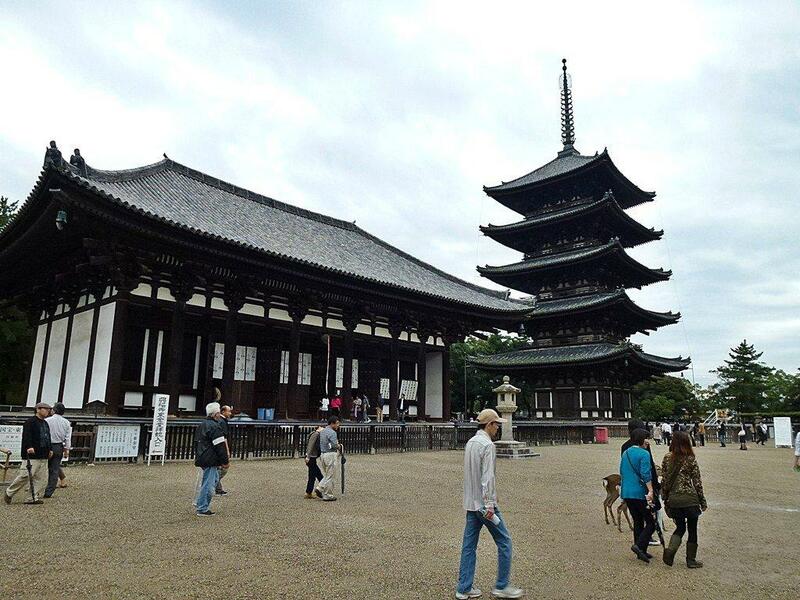 The most important buildings are the Central Golden Hall, today in restoration and not open to the public (works will be completed in 2018) and the Eastern Golden Hall (separate admission, 300 YEN) which has on the right side a famous 5-story pagoda (the second highest in Japan, 50 meters). Another smaller 3-story pagoda also belongs to this temple. 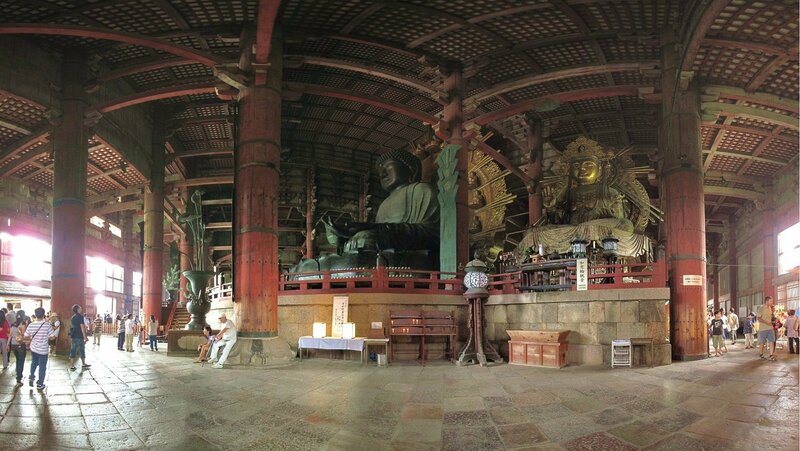 The interior of the main building of this ancient temple, founded in 747, houses an important series of sculptures: in the middle there is a wooden almost two meters high statue of Yakushi Budda (Yakushi Nyorai), surrounded by other 12 statues (of clay) representing twelve different guardians. An almost unknown Shinto shrine, surrounded by some particular cherry trees, it is situated opposite the National Museum, and easily reachable. I recommend a quick visit if you're in Nara in spring during the cherry blossom season (hanami). Naramachi is a small area east of the JR Nara Station and south of the Kintetsu Nara station, once it was the district of merchants of the town, and today preserves many historic buildings including some original machiya (typical houses of the merchants of Old Japan). A walk through the streets of the neighborhood is a great way to breath an air of "Old Japan", do shopping, and, if interested, visit some of the various small museums that are located there. A quite famous temple within this neighborhood is the Gangoji Temple (admission 400 yen, opening hours 9-17). Another of the places belonging to the UNESCO World Heritage Sites, it is located slightly to the east of Yamato-Saidaiji Station, reachable in a few minutes from Kintetsu Nara station through the Kintetsu Nara Line. It is a vast area where long ago, when Nara was the capital of the country, there were the residence of the emperor and various government buildings. Almost all of the original buildings have been destroyed over the years, those that we see today are all reconstructions. 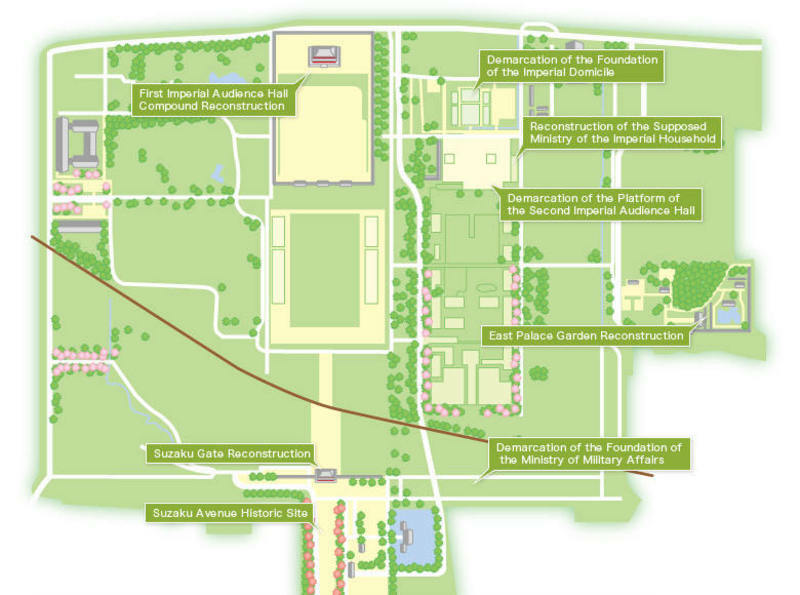 Particularly famous are the Daigokuden, the largest building in the complex that was used for important ceremonies, the Suzaku Gate, one of the main entrance gates, and the Toin Teien (East Palace Garden), the place used by the imperial family to host banquets. 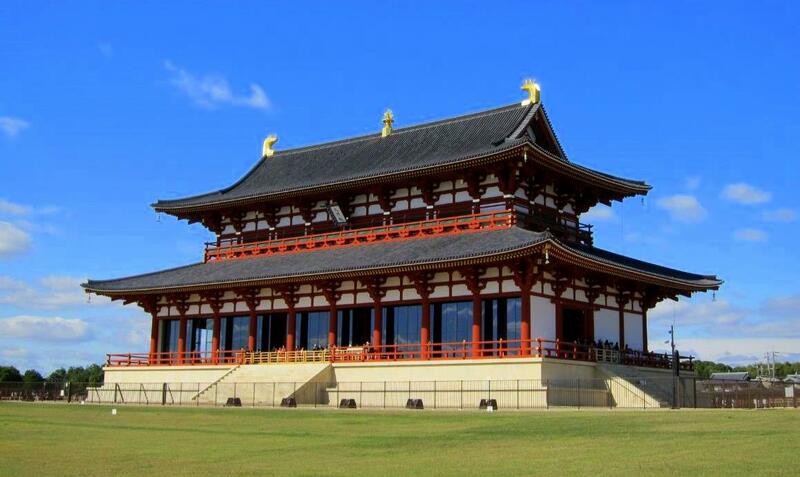 In this area there are also some archaeological excavations of ancient buildings destroyed, and a museum (Nara Palace Site Museum) containing various archaeological finds and info about Nara and its history. Another recently opened museum (Heijokyo History Museum) in the area instead exposes a life-size reconstruction of an ancient ship used for diplomatic relations with China. The entrance to the entire area is free, and the admission to the museums is free too (the Heijokyo History Museum should cost 500 YEN, but it is free for foreigners with a passport). These are two famous Buddhist temples near Nishinokyō station, reachable from Kintetsu Nara station taking the Kintetsu Nara line up to Yamato-Saidaiji station and there changing with the Kintetsu Kashihara Line (total of about 15 minutes, 250 YEN). Alternatively, from outside the JR and Kintetsu Nara stations leave a few buses to this area (travel times and fares similar to the train ones). The Toshodaiji is located 700 meters north of the station, te Yakushiji 300 south. Another temple that is part of UNESCO's World Heritage list. 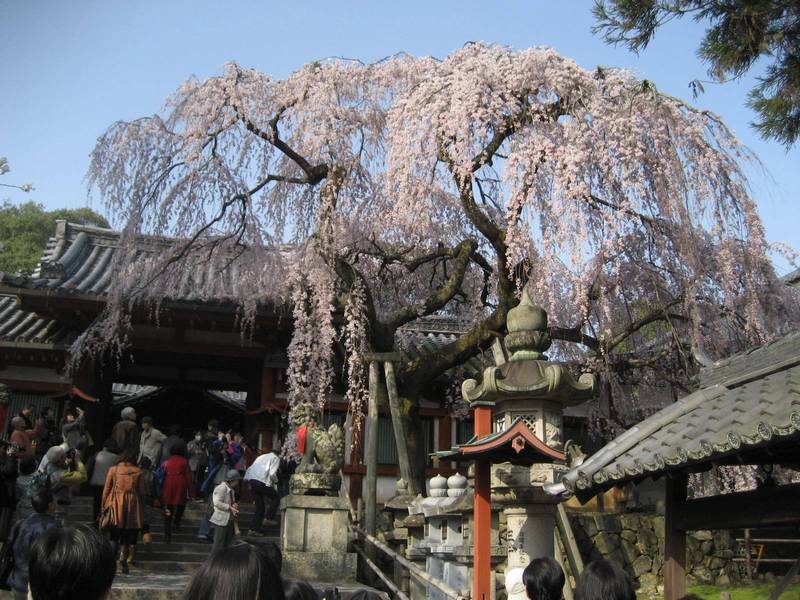 It was founded in 759 by a Chinese monk, Jianzhen (Ganjin), arrived in Japan by invitation of the Emperor to help to develop the Japanese Buddhist movement, and whose tomb is located within this temple. A complex of temples, founded in 680, easily recognizable because of the two three-story pagoda built on the sides of the main building. The pagoda on the east side is the only original building of the complex, built in 730, while the rest of the buildings was destroyed and rebuilt during the time. This complex also includes the Genjo-sanzoin Garan, a complex of temples just north of the main temple, built in 1981 and dedicated to the Chinese monk Genjo Sanzo. The business hotel I recommend if you want to stay one night in Nara. It belongs to the famous Washington hotels chain, with an excellent price-quality ratio where to find single rooms starting from 4,000 yen per night. The location is great, a short walk from both JR and Kintetsu Nara Station, and less than 1 km from Nara Koen, where some of the most famous temples of the city are located. A traditional Japanese style guest house in the old neighborhood of Naramachi, about 1 km away from the Nara Koen. You can sleep in shared rooms for just 2,500 yen per night, or in private rooms decorated in the traditional style of ryokans, starting from 7,000 yen for a double. The reviews are all very positive. The main stations of Nara are two, one is served by JR (Japan Railways) while the other is served by the Kintetsu Railways private comany, and they can be easily reached both from Osaka and Kyoto. The two stations are located approximately 1 km away from each other, the Kintetsu station is the most convenient of the two because it is closer to the Nara Park, one of the most famous places of the city. The Yamatoji line connects Nara to several important stations in Osaka: Osaka station (780 YEN, 50 minutes), Namba station (540 YEN, 43 minutes), Tennoji station (450 YEN, 30 minutes). These travel times refer to the Rapid Service trains (大和路快速), there are also local trains (普通) that take more time. The Nara Line connects Kyoto station to Nara (690 YEN). Be careful also in this case to take the "Rapid" trains (travel time 45-50 minutes) rather than the "Local" trains (travel time 75-80 minutes). From Osaka Namba station you can take the Kintetsu Nara line. There are limited express trains which require a seat reservation (1040 YEN, 30 minutes) and express trains (540 YEN, 40 minutes). The Kintetsu Kyoto line connects Kyoto station to Nara. There are limited express trains, which require a seat reservation (1110 YEN, 35 minutes) and express trains (610 YEN, 45 minutes). The express trains haven't many frequencies (one about one every hour).